The agile supply chain essentially refers to the use of responsiveness to the customer demand, competence to meet the market requirements, flexibility to change to the market dynamics and speed to manage the day-to-day operation of an end to end supply chain. Unlike the lean supply chain, the agile supply chain uses real-time data and up-to-date information, as reported by Martin Christopher in Industrial Marketing Magazine, to optimize operations and data in real-time against demand forecasts. the productivity of the given entity. The agility of the supply chain delivers balanced outcome by balancing service and cost in the form of optimising inventory. In simple, supply chain objective is to deliver what customer wants in a cost-effective manner. Today technology dominates how supply chains are executed and they play a vital role and makes things faster and more cost-effective, but it’s not perfect. It requires you to be as flexible as you can be. 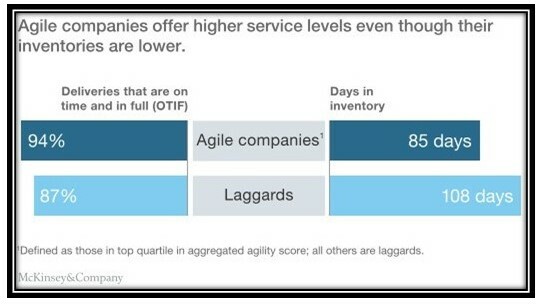 The below graphic explains how agility of the organisation offers higher service levels with lower inventory carrying. 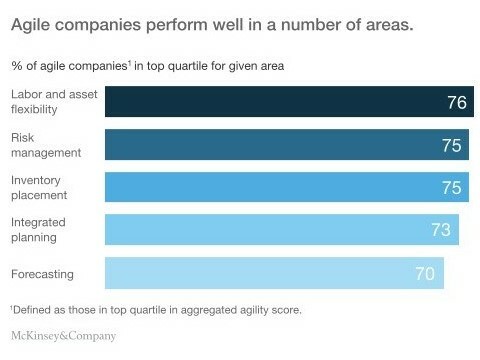 McKinsey & Company identified areas where agile supply chains perform more effectively, thus resulting in supply chain excellence. The factors that influence any supply chain is the technology, process and people, and the below chart reveals the top qualities of agile companies excellence. Agility in the supply chain is rapidly changing how supply chain entities work, but providers of supply chain management and management solutions need to understand how agile and lean concepts work together to produce more efficient demand-oriented supply chain. There is a myth that lean and agile supply chains are different, the truth is that understanding of agility in the supply chain must address how lean concepts are applied to the make supply chain agile. Failure to incorporate both agility and lean concepts can result in serious delays for a given supply chain entity. However, every factor in the agile supply chain can have a serious impact on the future trends of this series of positions. 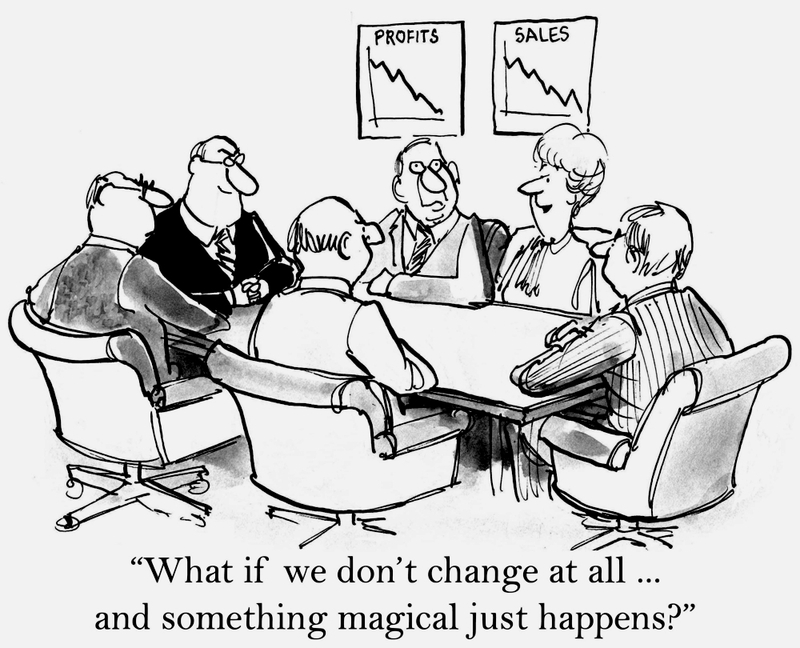 Some companies indeed have change and improvement, they believe everything is fine for so many changes, why should we change?